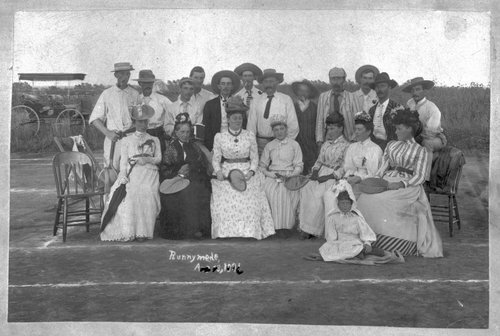 A photograph of the tennis club in Runnymede, Harper County, Kansas. In the late 1880s, F. J. S. Turnly established an English colony and training school for the sons of British gentlemen to learn the secrets of successful farming. Unfortunately, most of the young men were wealthy and their interest in farming waned. Instead they raced horses, partied, and played tennis. The colony disbanded in 1892 when the families in England decided their sons were learning very little about agriculture.